Early shows on weeknights. I love ’em. Last night’s show was done by 10:30 and that was sweet. To be honest, I was most excited about last night’s show to see Arsis again. They’re one of my favorites. Headcrusher was the local support (originally from Bogota, Colombia) for the show and they played a tight energetic set on a hot stage going on right around 5:25. They crushed it to an unfortunately small crowd. Always a pleasure seeing them, even if I’m not the biggest death metal fan. Chicago’s melodic death metal band, Starkill, was up next and to be honest, I couldn’t care. I had listened to a few tracks earlier in the day and they just didn’t catch my ear. They were pretty sloppy, too. Maybe the heat was too much. Don’t know. Can’t care. Arsis came on next and did what they do best…SHRED. They played an intense 7 song set opening with Handbook for the Recently Deceased from their latest album, Unwelcome. Not only do I like their riffs, I really dig the lyrics. Malone writes some pretty cool stuff that goes outside of the “hey look, we love satan” type lyrics in a lot of death metal. Great show, but always too short for my tastes. Destruction came on next and hit the growing crowd right in the face with Curse the Gods. They were tight but I could tell they were dying from the heat up there. I missed the middle part of their set as I went to the bar next door to sit down for a few minutes. My foot has been bothering me lately as well as my back (getting old!) and I needed a place to sit down for a little bit as Empire Garage doesn’t have seats anywhere. When I came back I caught The Butcher Strikes Back and Bestial Invasion. Shortly after their set, their tour manager invited me and 2 other guys onto their bus to hang out. Schmier and Mike were very welcoming guys. Schmier had made a comment from the stage about the Germany/USA soccer match from earlier in the day and I commiserated with him about it. We then got into a great discussion about Thin Lizzy. Mike is a huge fan. Good dudes. They also signed The Book! Seriously two of the nicest guys, along with their drummer, that I have ever met. 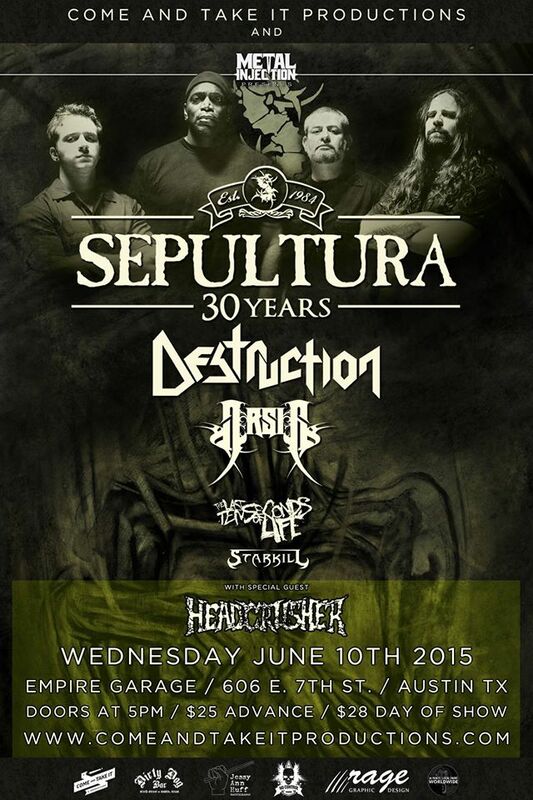 When I left the bus, Sepultura was already on stage. The crowd had filled in quite a bit. They sounded super tight, but I just couldn’t invest much time into them last night. They weren’t playing anything that I really cared to hear, so I went home.